Uma Thurman & Ethan Hawke's daughter Maya Thurman-Hawke is stepping into the limelight. She posed for pictures at the premiere of her TV mini series 'Little Women' on Monday(December 11th) at the Soho Hotel. 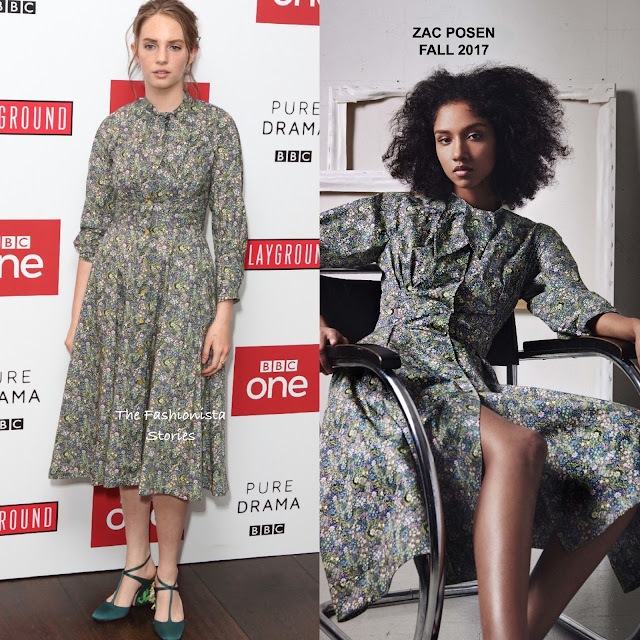 Turning to a designer that she has worn on several occasions, she wore a ZAC POSEN FALL 2017 green floral below-the-knee dress with a tie neck, bracelet length sleeves and a fitted waist. I think if she would have gone with some chic flats or T-strap sandals, it would have made this a more youthful look. She finished up with an up-do with tendrils and minimal make-up. What do you think of Maya's look?